This idea of “The Real World” has always confused me. Have these first twenty-one years of my life been pure preparation? Will graduation thrust me into some hellish alternative universe? The country’s current economic status is not a comfort to the soon-to-be grown-up. The recession has sent college students into a frenzy. What was once friendly competition has become a tooth-and-nail battle for class rankings. We find that every conversation ends up being about the LSAT or GRE. Our parents, grandparents, teachers, aunts, uncles, cousins — I bet even our pets if they could talk! — are constantly reminding us how difficult it is to find a job these days, how hard we’ll have to work, how much we’ll have to excel. We enter the job market low on hope but high on extra-curriculars; our resumes packed with random clubs and activities we hope will set us apart. It’s truly daunting. So daunting that some of us simply decide it would be best to stay in school as long as we can, increasing our debt but also our shots at success. This idea isn’t unique. Our chances of snagging our dream careers are slim to nonexistent, so applying to grad school seems to be the best way to remain reputably unemployed and fully insured. But if we assume we’re avoiding competition by opting to stay in school, we find ourselves sorely mistaken. We’re now grappling for spots in classrooms across the nation. We’re studying flashcards and Princeton Review test-prep books until our eyes are bloodshot and we’re agonizing over points lost in practice tests and which computer program is best for logic prep. It seems there is nothing we can do to find a way to relax. The stress is truly inescapable. But underneath all the tension, I find myself oddly excited to face the challenges that lay ahead of me. After all, it’s my life. We’re young right now, and lucky that the only people we have to worry about are ourselves. We apply, and apply, and if we don’t succeed, apply again. At least I know I’m still able to get discounts on delicious food while I still have my student ID. I can put my savings in my survival jar. 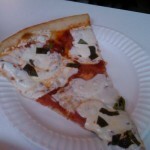 Adriana’s Pizzeria in Gramercy Park has a bunch of great deals for scrimping students, like the “Dorm Special,” which offers a large pie, 6 garlic knots, 6 buffalo wings, 6 mozzarella sticks, and a 2 liter bottle of soda for only $23.95. Did someone say girls’ night?! Hi. My name is Olivia and most of the time I am thinking about food. When my roommates and I stumble into our living room every morning — just after we’ve checked to make sure our turtle is still alive — we’re planning breakfast, lunch, and dinner. Things I enjoy: looking at food, smelling food, cooking food, microwaving food, talking about food, and ESPECIALLY eating food. My equal-opportunity stomach will accept food of any ethnicity, color, size (although more is more), or texture as long as it’s yummy— and therein often lies the problem. Like this past Wednesday, for example. My dear friend Tyler and I were running errands, (the purchase of school supplies and the like), when we realized we were both terribly hungry. Being an aficionado of food that comes from moving vehicles, I convinced my friend to give the potsticker cart a try. Because food that comes from a cart is cheap, right? At least that’s the impression I’ve been under for most of my independent life. We left the cart with quite a haul; both of us ordered eight veggie potstickers over noodles with hot and sour soup and our favorite bubble tea. Yet, as we settled ourselves on a rock in the park I realized we’d both spent around fifteen dollars on cart food. I beheld the greasy dumplings in my lap and couldn’t help but feel disappointed in myself. Sure, food from a van is tasty, but it’s supposed to be cheap! My stomach flip-flopped a bit, and not from the potstickers. Maintaining a balanced bank account while living as a college student in the cultural center of the universe can be difficult, and a fifteen dollar lunch isn’t something I can afford to treat myself to on a daily basis. 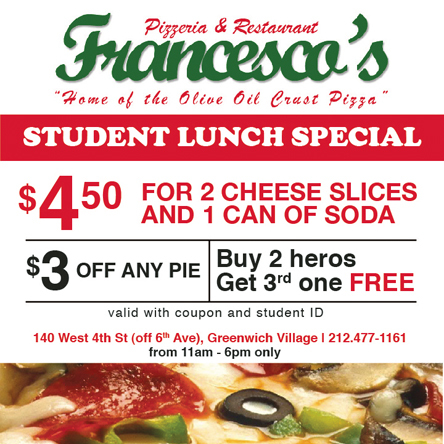 The Campus Clipper allows students to enjoy great products, experiences, and FOOD for reasonable prices— like the coupon they’re currently offering for Francesco’s Pizzeria & Restaurant in the West Village. 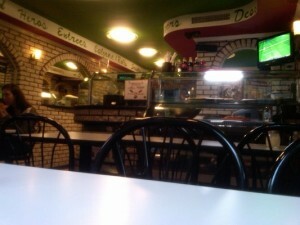 Their Student Lunch Special guarantees two slices of cheese pizza and a can of soda for $4.50— filling and reasonable! Or, if you’re in the mood for a group affair, the coupon offers $3 off any pie, or a deal on heros— buy two and the third’s free! The student ID is a beautiful thing, and with it — and your coupons from Campus Clipper — you’re all set to enjoy a reasonable lunch that won’t leave your wallet hungry.